Crowdsourcing — MAD STRATEGIES Inc.
Crowdsourcing was first used as a way for video game developers to test the early versions of games by inviting the public to participate in beta testing. This helped them identify bugs in the game and get player feedback on gameplay and appeal without having to hire paid help. Today, crowdsourcing takes many forms and is a great way to get help from people willing to invest time, energy and money on your idea. Crowdsource your funding: Kickstarter is a great example. Their mission is to "bring creative projects to life" by allowing people to donate money to ideas or products they are interested in supporting. Crowdsource knowledge and expertise: Subcontracting an expert or could cost hundreds or even thousands of dollars, and there is no guarantee you'll like any of the ideas they present. Crowdsourcing gives you access to tens of thousands of knowledgeable people. InnoCentive is a community where large corporations post technical or scientific problems to people who can help provide solutions through "fresh thinking and cost-effective problem solving". In September 2009, Netflix awarded a $1 million prize to the winner who successfully improved their collaborative filtering algorithm. Crowdsource innovative ideas and creativity: With no biases or preconceived ideas, crowdsourced designers are free to be as creative as they want and may come up with concepts or perspectives that company employees might have never thought of. It also allows you to leverage a virtually unlimited pool of minds, viewpoints, expertise, and experience. Crowdsource your marketing/advertising photography. Invite the public to upload pictures of your product in action. It makes them feel connected to your product and gives your brand exposure. Consider crowdsourcing as a form of customer outreach. Crowdsource feedback from your customers. This lets you know what you can change or improve. Listening to your customers will help you learn about their concerns and what parts of your product they like/dislike. People love to give their opinion. This shows your customers you care about them, that you aren't afraid to be vulnerable and want them involved in the process. Yahoo Answers is a great forum for asking questions. It provides access to large pools of people willing to answer questions of all kinds. When a truck that got wedged under an overpass, baffling all of the engineers and first responders on the scene, but it was a child who had the idea to let the air out of the tires to free the truck. Great ideas don't always come from experienced professionals. Sometimes "outsiders" can see obvious flaws and provide ideas that become the missing piece of the puzzle. Method cleaning products used crowdsourcing to create a "laundry montage" using footage submitted by fans. They invited people to join their mission to save the earth and be part of something fun! People love to share exciting news as you can see in the video below. Below is the instruction video for those who wished to participate and submit their video clip. And finally, the much anticipated laundry montage with fan submissions. "the wait is over. our crowdsourced music video has finally come together thanks to the wonderful submissions of our people against dirty (along with a stellar team behind the scenes). we took all of your videos and wove them together to make one great laundry montage. check it out, pass it along and then give us a try. thanks again to those of you who gave us a window into your laundry world! we couldn’t have done it without you." One of the best ways to get your project or product off the ground is to build a relationship with the crowd and identify those who are invested. Get to know the people who actually care about what you're doing. Keep in mind that making your project public also exposes you to competitors so don't give away more than you need to. Today, it's all about sharing. Crowdsourcing harnesses the creative and competitive spirit of people all over the world and creates affordable options for small businesses and entrepreneurs who need help. 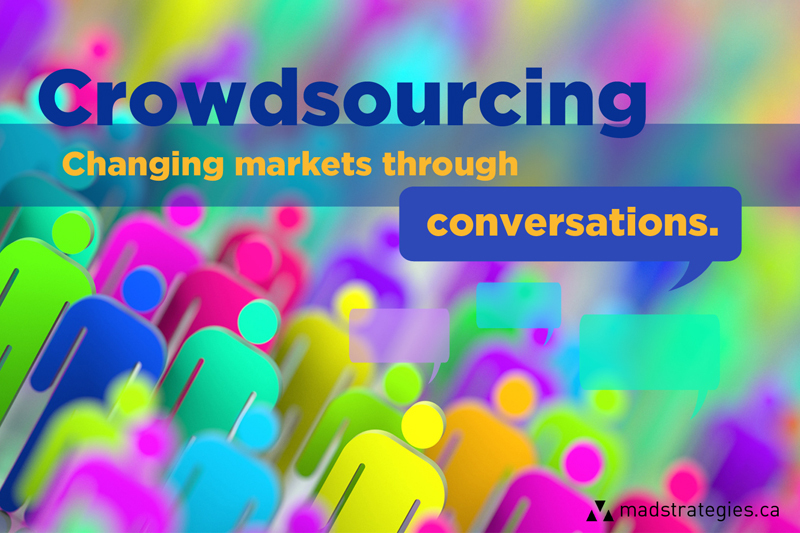 How can your business benefit from crowdsourcing?